I am a passionate sportsman, football player, coach, blogger, pundit and regular commentator with BBC London. I maintain high involvement in the game through my media appearances and as executive advisor of a 1000-strong football academy in Singapore. Most recently, I began transferring my experiences from the pitch – with the likes of Fulham, QPR, Man.Utd and England – into the boardroom be becoming a partner of PerformanceWorks, a mindset coaching organisation for leaders and managers of the future. Alongside my business partner and company founder Jeremy Blain, we launched in the UK early in 2018 and it’s been a busy time ever since! Through this work with PerformanceWorks International I am providing new perspectives around elite leadership, management, coaching, winning teams, diversity, bias and inclusion. 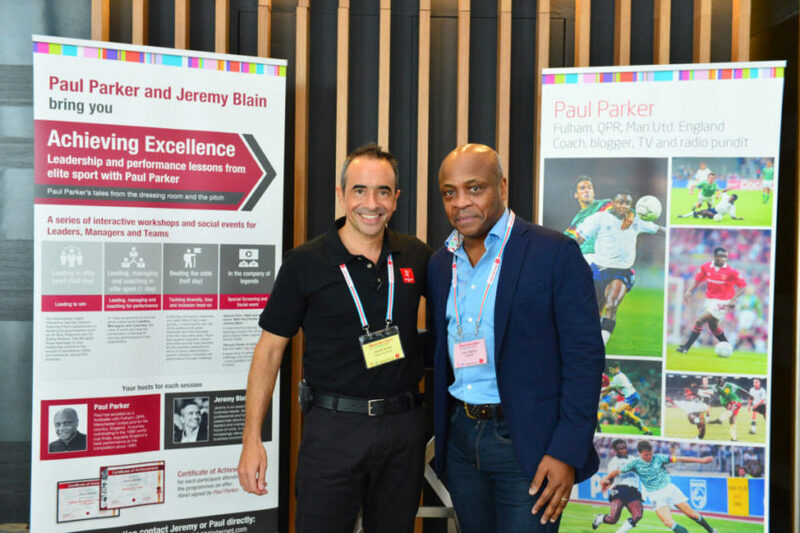 Since finishing my career as a footballer, I’ve been interested in how the skills developed in the sporting world can translate into the business realm. I met my business partner a couple of years ago in Singapore and we spent a lot of time in cafés, chatting, brainstorming and developing ideas. We established a common goal which was to create a mindset coaching business that would help leaders and managers through a seamless transition to a digital workplace. Digital transformation of course goes beyond digital and it requires changing mindsets from the top and tackling challenges such as diversity, bias and inclusion. Throughout my career as a professional football player, I spent a lot of time with some of the best leaders in the industry – most notably Sir Alex Ferguson. I learned valuable lessons about people and organisational management which I believe can be adapted to our business. In addition, at the beginning of my career, I myself was a victim of severe racism. While this taught me to develop a tough skin, it also made me determined to do my very best to fight for diversity and inclusion, and remove intentional or unintentional biases when possible. My business partner and I have developed a series of programmes which are all about achieving excellence in the business environment. We combine our experience in leadership, diversity and coaching from a business and elite sport perspective. I bring in the elite sport angle and my partner brings in the business leadership perspective. I was lucky enough to work under two of the most highly respected leaders in British football history: Sir Alex Ferguson and Sir Bobby Robson. I admire Alex Ferguson in particular because he knew how to manage people individually, not just collectively. When he hired a new player, he expected them to deliver and he knew how to get the best out of people when it mattered the most, and at the right time. Now that I am working more closely with businesses, I can see the real value and differences between strong leadership, management and coaching focus. Most importantly how to use them in different ways to drive high performance, from teams and individuals. I just wish I could have started doing this a little earlier! I think my business partner and I both bring a unique perspective into our business, which is to help teams and individuals to perform better in an ever-changing environment where the pressure to perform is always on. There’s always been pressure, but we are now in an age of work that demands constant self-improvement, different ways of training and different ways of thinking. For an organisation to be successful, leaders have to be able to cater to the needs of a wide range of different people, personalities and skills – our focus is on using our individual insights to make this happen. There is so much more pressure these days for quicker, better results – on the playing fields and in business. For someone starting out I’d say own your personal development, seek out those brilliant people around you who can train and coach you further. Another point is to be very open to feedback – put your pride to one side and embrace it. It has really helped me over the years and fast-tracks learning, dealing with issues and keeps communication very open. Overall always have a goal in mind. What do you want to achieve? When? How will you get there? This gives you and the people around you the focus and eyes on the prize.